German progressive rock titans Eloy have returned with “Visionary” after taking the better part of decade off from recording new material. Born from the era that gave birth to the ‘space rock’ genre, Eloy demonstrate an attitude and grace often associated with, but not normally expected from, progressive rock. “Visionary” is Eloy’s attempt to revisit and recreate the band’s vintage sound from its most popular era. 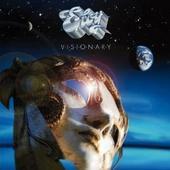 “Visionary” is predominantly progressive rock in the classic sense while the arching mellow nature and symphonic sounds round out the album’s overall impact. The band’s understated performances, alongside impressive songwriting, enhance the nuances of the music. Nimble bass lines support dynamic guitar/keyboard interplay. The vocals alternate between quiet delivery and forceful impact. A variety of guests provide instrumental shades of color and style to give “Visionary” depth. “Visionary” includes a special, brief documentary of the making of the album that provides insight to the creative and recording processes. “Visionary” was produced by Franz Bornemann. Eloy is Franz Bornemann on vocals and guitars, Klaus-Peter Matziol on bass, Michael Gerlach on keyboards, and Bodo Schopf on drums and percussion. Additional keyboards provided by Hannes Folberth. Guests include Anke Renner on vocals, Tina Lux on vocals, Voler Kuinke on flue, Christof Littman on keyboards and orchestra sounds, and Stephan Emig on percussion. For more information visit http://www.eloy-legacy.com/.